In this guide, we are going to look into no-start problems when the engine turns over (cranks), but won't start. If your engine won't crank at all, or cranks very slow, or the security light stays on, check the first part Why a car won't start troubleshooting tips. If your car has a push button start system, read this guide: No-start issues with the push-button start system. If your engine cranks normally, but won't fire up, you know that at least your battery is in a good shape and the starter motor works. First, check for common problems with cars like yours. Read more about possible causes below. Safercar.gov - click 'Vehicle Owners' then 'Search Complaints'. Carcomplaints.com - search for common complaints. For example, if you search the NHTSA complaints at Safercar.gov for the 2002 Chevrolet Impala, selecting "Electrical System" you will find a number of no-start complaints related to the "Passlock" feature. Now, Google "Passlock" and you will find a number of threads at various forums describing the problem and ways to fix it. Searching online forums dedicated to a make and model you have can also be helpful. You also can search Technical Service Bulletins (TSBs) for your car, if a similar problem already happened to other same-model cars, there is a good chance that the car manufacturer issued a TSB describing this problem. We posted several links at this article where you can get a subscription-fee based access to a factory repair manual and technical service bulletins. Here are a few common causes. This problem is common, especially in high-mileage vehicles. A car starts then stalls out and doesn't re-start again. What happens, the excess gasoline fouls spark plugs and washes the oil from the piston rings lowering the compression. Mazda RX-8 was well known for flooding. Your mechanic may advise replacing or at least removing and drying out the spark plugs and re-charging the battery. Once spark plugs are removed, the excess gasoline dries out. With a fully-charged battery and clean spark plugs, the engine should start if there are no other problems. Watch these Youtube videos to learn more. Fuel pump relay or fuse or main relay (module) failures are common in some vehicles. In many Honda cars, a failed PGM FI Main Relay could cause a car not to start. In some Chrysler and Dodge vehicles, a bad ASD relay was often responsible for a no-start. A bad FPDM module in some Ford vehicles could cause the same problem. In some Chrysler, Dodge, Jeep cars, the corrosion at the relay/fuse box (TIPM module) is another problem that can cause a no start. While researching, we found many complaints related to the Totally Integrated Power Module (TIPM) and not only about starting. In some Ford F-150 vehicles, an overheated fuse F27 in the battery junction box (BJB) can cause the vehicle not to start. Read more: How to check a fuse in a car. Replacing the relay or module is not as expensive as some other problems. Fuel pumps are known to fail too. One day, a fuel pump just stops working and the engine cranks, but doesn't start. We strongly recommend that you trust any fuel-related problems to a qualified technician, as in most cars the fuel pump is installed inside the gas tank. Gasoline is EXTREMELY FLAMMABLE! When you take your vehicle to the repair shop, your mechanic will need to run a few tests. It's not difficult to find out if a car doesn't start because no fuel comes from the injectors. See what Youtubers have to say. If the fuel pump doesn't run, your mechanic might have to check the electrical circuit, including the connector and fuel pump relay. With any fuel-related problem, consider taking your car to the dealer, they have qualified technicians and proper tools. A high-pressure fuel pump (HPFP) is another culprit for no-start and long crank problems. The high-pressure fuel pump is installed on the engine and is a part of direct fuel injection. When it's failing, first a car lacks power and needs to be cranked longer before the engine starts, then it dies completely. Search for HPFP problems in BMW 335i or 135i, you will find plenty. In many cars a failed mass air flow sensor can cause a car not to start. A car might start for a second, but stall immediately. 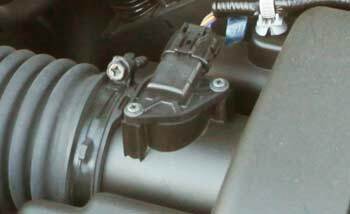 Mechanics often use a known-good mass air flow sensor to test if the engine starts. We have seen mechanics disconnecting the mass air flow sensor to see if the car starts without it. Replacing a mass air flow sensor is easy and not very expensive ($30-$160 part plus $50-$120 labor). Read more about a mass airflow sensor. A crankshaft position sensor (crank sensor) is an important device measuring the engine RPM and tracing the crankshaft position. A car won't start if a crankshaft position sensor doesn't work properly. A crank sensor can fail, or its wiring can get damaged. This may cause a car to stall out or not to start. Often this happens intermittently. A crankshaft sensor can be tested with a scan tool or a multimeter. Read more about it here: Crankshaft position sensor. A camshaft position sensor or cam sensor works similarly except it measures the rotation of the camshaft. Many cars have two cam sensors, one for each camshaft. Problems with the cam and crank sensor are common in many vehicles, including older Nissan and Chrysler models. In some older cars, including GM and Volkswagen, an ignition coil pack was known to fail. Often it would happen in a rainy weather or after washing the engine. Your mechanic can test the coil pack. The part is not very expensive. Now, most cars have separate ignition coils for each cylinder. Although they are also very common to fail, they won't cause an engine not to start. Read more about ignition coils. Often this problem happens after a timing belt or chain is replaced. If a car doesn't start after this repair, the timing must be checked first. In cars with a timing belt, an old belt can jump/skip a few teeth, which will change the timing. In some cars with a timing chain, a chain can also skip a tooth if a timing chain tensioner fails or if there is not enough oil in the engine. If a timing belt or chain skips in an interference engine, especially at high speed, there is a chance that the valves can get bent. This could be an expensive problem to fix. Your mechanic might suggest checking if valves are not bent before spending money on a new belt or chain. In a non-interference engine, replacing a timing belt (or chain) with related parts and resetting the timing might fix the problem. Read more about a timing belt. An engine might lose the compression in the cylinders after severe overheating or when a timing belt or chain skips. Replacing an engine, in this case, might be less expensive than repairing it. Replacing an engine with a used unit costs from $1400 to $3300 depending on the part cost and the complexity of the work. With today's well-developed network of auto recyclers locating a used engine is not very difficult. We have seen many engines replaced successfully. A faulty engine computer or PCM is rare, but some cars had known issues with it. For example, older Nissan Sentra and Ford Escape models. We had seen problems where the PCM circuit or a fuse were shorted after boosting a dead car battery. In some cars, you can tell that the PCM is not powered if the "Check Engine" icon does not illuminate with the ignition on. In some older Mazda cars, the corroded wire at the PCM fuse in the fuse box is known to cause a no-start issue. The PCM is an expensive part, however it is usually covered by an emission warranty (8 years or 80,000 miles). Read more: How to check fuses in a car.